The ‘Truth’ Is the Over-Lord of All. That human alone obtains it, to whom; He (GOD) blesses. Sri Guru Granth Sahib describes the qualities of God and why one should meditate on God's nām, worship and or remember only God. Daharm (Sach) is the ‘Truth’ of entire Universe including of world. If someone grasps this thing; there is but one religion of ‘Truth’. By Guru’s instructions, the mortal is rendered perfect all the ages through. (Reference: Ang-1188 of Sri Guru Granth Sahib). What is Dharam (Sach)? Speak the ‘Truth’ on solemn affirmation and utter not falsehood. The disciple ought to travel by the route, which the Guru the Guru points out. (Reference: Ang-488 of Sri Guru Granth Sahib). Dharam (Sach)- ‘Truth’ is not word of combination of a few words only, Dharam (Sach)- ‘Truth’ is one perfect package, is a reality. In this, all worldly qualities exist or are enshrined. All pious habits are in it. For this reason, Dharam (Sach)- ‘Truth’s’ place is supreme in Gurbani and the ‘Truth’ is known as the Over-Lord of all in Sri Guru Granth Sahib. What is the difference between Mazhab-Religion and Dharam (Sach)- ‘Truth’? Religions have different principles and rules, but ‘Truth’ has no different principles and rules. The ‘Truth’ is common for all, but religion is never common for all. To follow religion is must and necessary, but to follow the ‘Truth’, religion is not must and necessary. Religion is identified and or recognized by the dress of a man, but the ‘Truth’s’ identity and reorganization is by the character (nature, quality, temperament, personality, disposition, spirit, moral fiber, makeup-creature, charm, appeal, atmosphere, integrity, reputation, eccentric) of a man. The ‘Truth’ is by birth within every creature, where religions are being adopted differently by all persons after birth. Man (he and she included) being follower of any religion, can adhere to truth, but here, it is must and necessary to understand that what is the knowledge of any religion? Whether it is for particular community, class etc or is it for all mankind or humanity? As without circumcision (Sunat), a man cannot become Muslim, but that man can become, Dharmak- holy, sacred, pious, godly, devout, virtuous, and righteous and the ‘Truth’ can be attained by him. As without hair, a man cannot become Sikh, but that man can become, Dharmak- holy, sacred, pious, godly, devout, virtuous, and righteous and the ‘Truth’ can be attained by him. Any person after wearing (Chola), long shirt, long robe, Loose long shirt, gown etc with (Five Kakar) five symbols of Sikh religion i.e. Kachera, Kara, kirpan, kes and Kangha can be said to be Sikh himself, but it is not sure whether he is also Dharmak- holy, sacred, pious, godly, devout, virtuous, and righteous and the ‘Truth’ has attained by him. Similarly, without adopting the principles and rules-Code of conduct of any religion, no one can become member of that religious movement, but without all this, a man can be Dharmak- holy, sacred, pious, godly, devout, virtuous, and righteous and the ‘Truth’ can be attained by him. To our good luck, that Sikh religion is very near to the ‘Truth’, because of source of knowledge of Sikhs is Sri Guru Granth Sahib. It is the perfect ‘Truth’. It is for all mankind and humanity in the Universe including the whole world. Sri Guru Granth Sahib is the perfect ‘Truth’, and, Sri Guru Granth Sahib is for all mankind and when it is said by Sri Guru Granth Sahib ji that One Lord is the Father of all and we are the children of the One Lord. Sri Guru Granth Sahib ji is addressing to all mankind. Sri Guru Granth Sahib ji, when even addressing to individuals like Bhai, Meet, Piare etc (all friends) used such words for all mankind irrespective of any Hindu, Sikh, Christen, Muslim, Bodhi, Yahudi, Jaini …etc as it also proves from that, ‘First God created light and then, by His Omnipotence, made all the mortals. ‘From the one light has welled up the entire Universe. Then who is good and who is bad? (Reference: Ang-1349 of Sri Guru Granth Sahib). In the light of Sri Guru Granth Sahib: The religions (Mazhab-Religion-Faith-Belief-Creed) in the whole world known as religions like Hindu, Sikh, Christen, Muslim, Bodhi, Yahudi, Jaini …etc are not religions. In fact, these were different religious movements under the name and garb of the ‘‘Truth’’ (‘Truth’ means fact, reality, certainty, accuracy, genuineness, precision, exactness, legitimacy, veracity, ‘Truthfulness’, honesty, candor, integrity, dedication, loyalty, devotion, fidelity, uprightness, sincerity). The emphasis of the author in the note by S. Satnam Singh-M-514-219-2525 published in info@ thekhalsa.org, recently in Panjabi language, in the light of Sri Guru Granth Sahib (The Guru Granth Sahib, is the sovereign active living Guru of the Sikhs. It is a voluminous text of 1430 Angs, compiled and composed during the period of Sikh gurus, from 1469 to 1708. It is a collection of hymns or Baani describing the qualities of God and why one should meditate on God's nām, worship and or remember only God), was that in the whole world, ‘The ‘Truth’ Is the Over-Lord of All’. 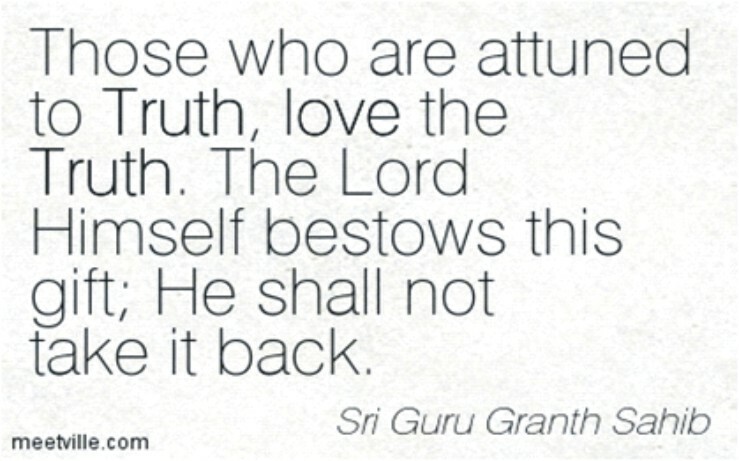 The author of the article quoted numerous references from Sri Guru Granth Sahib stressing on the theme that ‘The ‘Truth’ Is the Over-Lord of All’. The author clarified with the quotes from Sri Guru Granth Sahibs that every human can’t be part of all religions like Hindu, Sikh, Christen, Muslim, Bodhi, Yahudi, Jaini …etc, those were and are not religions factually, but were different religious movements under the name and garb of ‘Truth’. But, the whole world must follow the ‘Truth’, because ‘The ‘Truth’ Is the Over-Lord of All’ and all humans must follow ‘The ‘Truth’’ irrespective of their religions, prevailing in the whole world now. As the religions have their different principles, but ‘The ‘Truth’ Is the Over-Lord of All’ has no different principle to practice in the whole world by all. 1. If someone grasps this thing; there is but one religion of ‘Truth’. By Guru’s instructions, the mortal is rendered perfect all the ages through. (Reference: Ang-1188 of Sri Guru Granth Sahib). 2. What is Dharam (Sach)? Speak the ‘Truth’ on solemn affirmation and utter not falsehood. The disciple ought to travel by the route, which the Guru the Guru points out. (Reference: Ang-488 of Sri Guru Granth Sahib). 4. By loving the One Lord, other worldly love departs, O Kabir. It matters not, whether thou wearest long hair or whether thou shavest the head clean. (Reference: Ang-1365 of Sri Guru Granth Sahib). 5. Sing thou the pure praise of Creator, contemplating whom, even for moment thou shall be emancipated. (Reference: Ang-747 of Sri Guru Granth Sahib). Let them move their own way to worship the Creator. 6. Some call on the Lord, “Ram, Ram” and some “Khudha”. Some serve Him as “Gosain” and some as “Allah”. (Reference: Ang-885 of Sri Guru Granth Sahib). 7. Says Nanak, he who realizes God’s will know the secret of the Lord Master. (Reference: Ang-885 of Sri Guru Granth Sahib). But, finally concluded that the ‘‘Truth’’ Is the Over-Lord of All. Referred and references are given from: SRI GURU GRANTH SAHIB- English & Panjabi Translation, Translated by Manmohan Singh, published by SHIOMANI GURDWARA PARBANDHAK COMMITTEE, AMRITSAR –Fourth edition-1996 and the contents from internet service also.